Looking at old bugs is a great way to quickly find new ones. Sometimes the root cause of a bug can be subtler than it appears and the patch only fixes a symptom rather than the bug. Sometimes there can be other variants of a bug which the patch missed. And sometimes the patch just introduces new bugs, especially if the code is complicated. // FIXME: add special cases of joinStrings() for (separatorLength == 0) and (separatorLength == 1). Here we create the string long_string with a length of 0x10000 then append that same string 0x10001 times to the array arr. Note that this doesn’t create 0x10001 copies of long_string; each element of the array is just a reference to long_string. When we append the final 0x10001’th string m_accumulatedStringsLength will become 0x10000 again. Presumably bad things will now happen. This bug was patched by changing the type of m_accumulatedStringsLength to Checked<unsigned, RecordOverflow> so when that 0x10000'th string is appended the overflow will be detected and any subsequent safeGet will fail. The third parameter of joinStrings is an unsigned int, so when finalSize (a size_t) gets passed to this function it will be truncated from 64-bit to 32-bits. By triggering the integer truncation in the call to this function we can force outputLength to be shorter than the actual length of all the strings which will end up being copied in the appendStringToData calls, meaning that they will start to write outside of the bounds of the allocated string. Note however that the minimum length of data that will get written out-of-bounds is over 4 gigabytes, since the total length must be >= 2^32 to trigger the truncation, and that truncation will have the effect of subtracting at least 2^32 from the length which will then be passed to tryCreateUninitialized. In order to bound the memory copying loop and let us turn this into a controlled heap buffer overflow we're going to have to set up the heap in a very exact way such that we're able to corrupt all the strings which are involved in the copy (truncating them) whilst also corrupting something else useful for getting code execution. By forcing enough allocations of the same size we can force subsequent allocations of that size to be next to each other in memory, with each new allocation being at a lower address until after a certain number of allocations the addresses will jump up again. Free lists are Last-In-First-Out: if you free an object the next allocation of an object of the same size is very likely to get allocated where that free’d object was. This is a very simplified explanation but it’s enough for this exploit. Check out the tcmalloc specific links to understand exactly how and why this happens. undersized buffer is the buffer which joinStrings will allocate to copy all the copies of the strings in the JSStringJoiner into. What we’re aiming to do is line up following this allocation in memory any strings which we used to build up the array (so that we can overwrite their length fields with 0) followed by a target object we want to overwrite. My high level exploitation strategy for this bug is to trigger it twice: the first time setting things up to create an infoleak which will allow us to defeat ASLR and the second time round setting things up to overwrite a vtable pointer and pivot to a ROP stack. 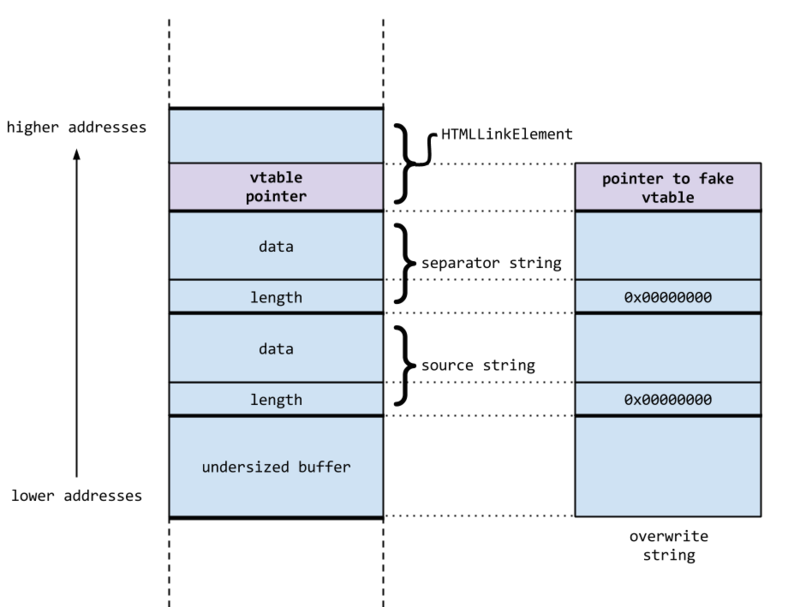 On the left is the heap layout we’ll try to groom, it consists of 5 objects: the first is the undersized buffer which joinStrings allocated - this is the buffer which if we do nothing else more than 4GB will be copied into. Following this are the two strings which will form almost all the contents of the array. These are the strings which we want to truncate by setting their lengths to 0. 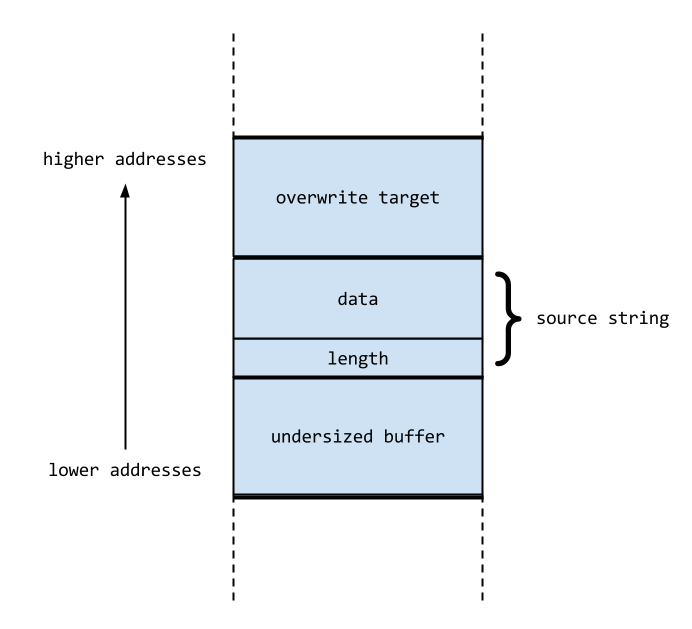 We need two strings since we have to be able to control the integer truncation exactly so that the allocation of the undersized buffer is the right size and the length of the overwrite string is the right length. By using two strings with one character difference in their lengths we can easily truncate to any length by calculating how many copies of each string should be in the array. Following these is the StringImpl which we’ll overwrite the length of and use for the infoleak. Finally, the fifth object is an HTMLLinkElement; we want to read the vtable of this object. The string on the right of this diagram will be the first element in the array to be joined and consequently will be the only string which will actually be copied into the undersized buffer (if the grooming works.) This is the string which will completely overwrite source string and separator string (setting their lengths to 0) and the length field of leak string (setting it to 0xffffffff.) It doesn’t matter where on the heap this string is allocated. We can allocate the first four objects for the groom in quick succession (the HTMLLinkElement and three strings) but the undersized buffer will only be allocated after we’ve built the entire array which will be joined and called join. Since this array will have a few million entries building it is likely to cause some heap churn and it’s very unlikely that there will be no other heap allocations of the target size we're trying to groom. Therefore it would be useful to have a free primitive such that we can allocate a placeholder object where we would like undersized buffer to end up, build the array and then free the placeholder right before calling join to trigger the bug. As tcmalloc’s freelists are LIFO we’re much more likely to end up getting the undersized buffer allocation in the right place if we can free the placeholder object reliably. 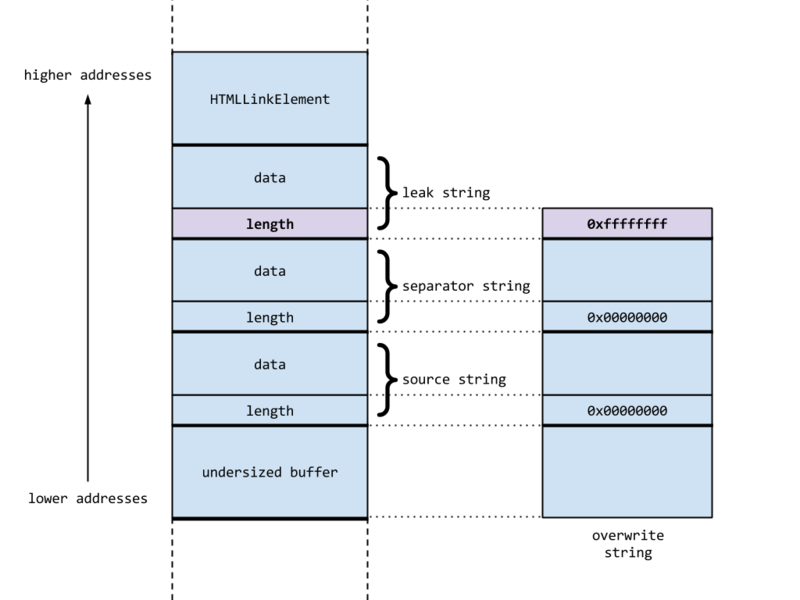 We can compute the load address of the WebCore library by reading the vtable pointer of the HTMLLinkElement and subtracting the known offset of that vtable in the library. Executing these instructions will set the stack pointer to point to the fake vtable string, so if we’re careful about how we build that string we can use it as both a fake vtable and a ROP stack. At this point we’ve achieved native code execution; the last step for part I is to load a secondary payload and execute it. For this I’m using a very simple ROP stack which writes a dynamic library to disk and calls dlopen to load it allowing me write the real payload in C. Take a look at the linked exploit to see how this ROP stack actually works. in the sandbox definition file for the web process means that we can read and write arbitrary files in the user’s ~/Library/Keychains folder from inside the Safari renderer sandbox. The ROP stack opens a file in there, writes the contents of a dynamic library to it and calls dlopen to load it. In part II we’ll replace this payload with a kernel exploit allowing us to break out of the sandbox. You can take a look at the complete exploit here [ https://code.google.com/p/google-security-research/issues/detail?id=77 ]. It’s been edited from the actual one thrown at CanSecWest to target this [ http://builds.nightly.webkit.org/files/trunk/mac/WebKit-SVN-r161944.dmg ] old nightly build which is also vulnerable and easy to test with if you want to fire up a debugger and try it out. All the offsets and assembly snippets in the write-up are also from that build. Thank you very much for this right up! Documentation for Reversing and Vuln Research is sparse and indepth case studies are sparser still. This is awesome!